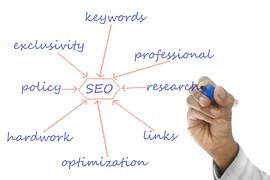 In the Field of SEO-Search engine optimization, choosing keywords is one of the most important tasks. You should choose keyword wisely. Choosing keyword is not a guessing Game but it is an art. As you probably aware of search engine traffic. Search engine traffic is very very important for success of any website. It is estimated that approximately 65 to 85% of traffic (average) coming from search engine (however is depends on how you promote your website).search engine is only way to create highly targeted traffic. You can improve visitor to sales ratio of your website if you successfully receive traffic from search engine. Or improve your revenue by attracting more visitors. There are lots of tools for choosing better Keywords like Nichebot, overture keyword suggestion tool, Wordtracker etc…First decide “what is your target market?” and then use these tools. Example you are selling E-books related to website design. Than you should first research how many people every day search for ‘Web Design E-books” go to Nichebot.com for that and simply search Web Design E-books. Nichebot will provide you count of last 60 days for this Key Phrase. We can see that Count for this key phrase is………..Or Go to Wordtracker.com site and search for this keyword Phrase and you will see related information on specific key phrase and you will be able to get information related to this keyword. Phrase. you can follow one of the following tool for keyword research. Meta tags are invisible for Visitor and as you might know search engines like Yahoo, Google, MSN are Not providing weight to them to rank your page. But still you can place your keywords in Meta title, keywords and description section. This is very important place where you should place your keyword for better ranking in search engine. The main Keywords must be here for which you are optimizing your site. Try to include its synonyms Key phrases / keywords also to receive traffic of related keywords. You are including your two targeted keywords here. Before you choose any domain name, directory or sub directory you should consider your keywords/ key phrases and also choose them according to your target market. Just look at my site. I selected sub domain for my site like http://directory-submission.inetzeal.com/ and http://link-building.inetzeal.com/ for targeting my keywords. ./directory-submission.html because search engines text matching will match this keyword and will rank your site on top with your competitor.